For the 1980s model called the Ninja 1000R in some markets, see Kawasaki GPZ1000RX. 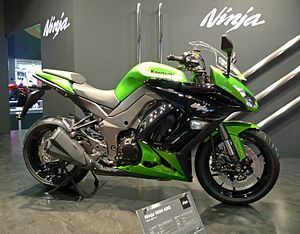 The Kawasaki Ninja 1000 (sold in some markets as the Z1000S or Z1000SX) is a motorcycle in the Ninja series from the Japanese manufacturer Kawasaki sold since 2011. Other than its name, it is unrelated to the Ninja 1000R produced from 1986–89, or to other Ninja motorcycles. It is generally characterized as a fully faired sibling of the Z1000 streetfighter, sharing the same 1,043cc liquid-cooled, electronic fuel-injected, 16-valve four-stroke inline-four engine and aluminum twin-tube backbone frame, but with ergonomics, storage, larger fuel tank and other design elements more oriented to the sport touring market. The Ninja 1000 is also fitted with an electronic speed limiter,not because it is capable of exceeding the 300 km/h (186 mph) agreed to in the gentlemen's agreement but apparently to keep its top speed the same as the unfaired and unlimited Z1000. Kawasaki has positioned the bike as a "sport bike for the real world." As the model will not be homologated for racing purposes, the designers were free to make compromises for street performance. The Ninja 1000 thus has an upright seating position, large fuel tank, and adjustable windscreen among its features, as well a transmission geared for street-riding as opposed to racing. Nevertheless, it retains the large engine and aggressive styling of a sport bike, and its performance characteristics remain on the sport end of the spectrum, placing its sports-touring type more in competition with bikes like the Honda VFR1200F or Triumph Sprint GT as opposed to the Kawasaki's Concours or Yamaha FJR1300. The updated 2017 bike received a wider front fairing and a taller wind screen, also the addition of a brighter LED headlight replacing the previous halogen light. New high level electronics include the addition of a six-axis IMU that works with ABS and traction control. The new addition results in a new claimed wet weight of 518 lb (235 kg).Compliant with Euro 4 rules, furnished with new styling and capable of competing with Suzuki GSX-S1000F, KTM 1290 Super Duke GT, MV Agusta Turismo Veloce and the Ducati SuperSport of 2017, the bike will contribute to the regained strength of the sports-touring class. ^ a b "Kawasaki's New-For-2017 Ninja 650, Z650, Z900, Ninja 1000, and ZX-10RR". Motorcyclist. November 13, 2016. Retrieved December 20, 2016. Wikimedia Commons has media related to Kawasaki Ninja.